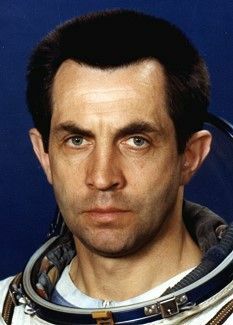 Russian engineer cosmonaut 1973-1993. Graduated MAI, 1964 Civilian Engineer, Korolev OKB. Trained for a Buran flight. From 1993 served as deputy director of 29th Department, RKK Energia. Status: Inactive; Active 1973-1993. Born: 1940-09-28. Spaceflights: 2 . Total time in space: 147.53 days. Birth Place: Ivanteevka, Moscow. Detachment: TsKBEM- 3. Departed Date: 1993-11-03. Family: Cosmonaut. Country: Russia. Spacecraft: Salyut 6, Salyut 7. Flights: Soyuz 16, Soyuz 19 (ASTP), Soyuz 25, Soyuz 26, Soyuz 27, Soyuz 29, Soyuz 31, Soyuz T-6, Soyuz Buran Support. Projects: ASTP. Agency: Korolev bureau. Bibliography: 4452, 5551. 1940 September 28 - . Birth of Aleksandr Segeyevich Ivanchenkov - . Nation: Russia. Related Persons: Ivanchenkov. Russian engineer cosmonaut 1973-1993. Graduated MAI, 1964 Civilian Engineer, Korolev OKB. Trained for a Buran flight. From 1993 served as deputy director of 29th Department, RKK Energia. 2 spaceflights, 147.5 days in space. Flew to orbit on Soyuz 29 (1978), Soyuz T-6. 1977 December 10 - . 01:18 GMT - . Launch Site: Baikonur. Launch Complex: Baikonur LC1. LV Family: R-7. Launch Vehicle: Soyuz-U. Soyuz 26 - . Call Sign: Taimyr (Taimyr - Russian peninsula). Crew: Grechko, Romanenko. Backup Crew: Ivanchenkov, Kovalyonok. Payload: Soyuz 7K-T s/n 43. Mass: 6,800 kg (14,900 lb). Nation: Russia. Agency: MOM. Program: Salyut 6. Class: Manned. Type: Manned spacecraft. Flight: Soyuz 26. Spacecraft Bus: Soyuz. Spacecraft: Soyuz 7K-T. Duration: 37.42 days. Decay Date: 1978-01-16 . USAF Sat Cat: 10506 . COSPAR: 1977-113A. Apogee: 235 km (146 mi). Perigee: 205 km (127 mi). Inclination: 51.60 deg. Period: 88.80 min. Manned two crew. Docked with Salyut 6. Carried Yuri Romanenko, Georgi Grechko to Salyut 6; returned crew of Soyuz 27 to Earth. Conduct of joint experiments with the Salyut-6 scientific station..
1978 July 29 - . 04:00 GMT - . EVA Salyut 6 EO-2-1 - . Crew: Ivanchenkov, Kovalyonok. EVA Duration: 0.0868 days. Nation: Russia. Related Persons: Ivanchenkov, Kovalyonok. Program: Salyut 6. Class: Manned. Type: Manned space station. Flight: Soyuz 29. Spacecraft Bus: Almaz. Spacecraft: Salyut 6. Stand-Up External Vehicular Activity. Retrieved material samples and equipment..
1978 August 20 - . Kamanin in Star City. - . Nation: Russia. Related Persons: Ivanchenkov, Kovalyonok, Yeliseyev. Program: Salyut 6. Flight: Soyuz 29. At a visit to Star City, Kamanin is allowed to participate together with Yeliseyev in a communications session with the EO-2 crew (Ivanchenkov, Kovalyonok) aboard Salyut 6..
1978 November 2 - . Landing of Soyuz 31 - . Return Crew: Ivanchenkov, Kovalyonok. Nation: Russia. Related Persons: Ivanchenkov, Kovalyonok. Program: Salyut 6. Flight: Soyuz 29. Soyuz 31 landed at 11:05 GMT with the crew of Ivanchenkov and Kovalyonok aboard..
Soyuz Buran Support (cancelled) - . Crew: Bachurin, Ivanchenkov. Backup Crew: Balandin, Borodai. Nation: Russia. Program: Mir. Flight: Soyuz Buran Support. Spacecraft Bus: Soyuz. Spacecraft: Soyuz TM. Planned Soyuz flight to Mir. Main purpose was to provide spaceflight experience to Bachurin and Borodai, who had been selected as back-up crew of the first manned Buran flight. Cancelled in cut-backs after fall of the Soviet Union..